Are you seeking Creative Inspiration & Motivation ? Do you want to unlock your Creative Potential ? Are you ready to Take Action to give your Innate Intuitive Inner Wisdom Creative Expression ? off to an Expressive start ! WHAT IS VISUAL JOURNALING & HOW DOES IT WORK ? In visual journaling, just about anything creative goes! Painting, writing, collage, sewing, gluing, use your favourite pens, images & colours to express your ideas on the page. We are NOT looking to create Art here and no-one is judging your work, although we are often our own worst critic ! Daring to Create makes us vulnerable to criticism & judgement (especially our own), so creating, being creative, can take COURAGE. Maybe you feel like you’re not ‘creative’ or ‘artistic’ and yet you still have a longing for self expression and creativity. Maybe you think you’re just not good enough to be creative? 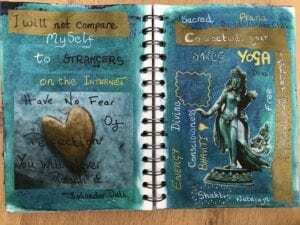 This 30 Daring Days of Creative Courage project is designed to help connect you with and give expression to, your own creative voice. What we PRODUCE during this project is not so important as giving ourselves the time & space by which we can begin to PROCESS our feelings and emotions, our creative thoughts and ideas. The idea is that you have FUN creating a journal full of your own thoughts & dreams, your favourite colours & images just for you ! Starting on 1st January 2019 you’ll receive a daily email from me containing a quote and a prompt as a jumping off point for your journal entry for that day. I have selected 30 quotations which I hope reflect the theme of Creative Courage and that they will stimulate & motivate your creative ideas & desires. Along with each quotation I have written some brief thoughts (prompts) which might help guide you in making your journal entry for that day. Of course what you choose to enter in you journal is completely up to you! Write, colour, draw, paint, collage, do whatever you feel moved to do in response to the quote of the day. Simply sign up by clicking on the link at the bottom of this page and you will be added to the mailing list. Its as simple as that ! 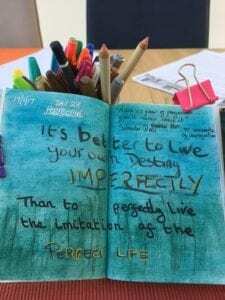 Once you have signed up you will be all set to receive a daily Quote and Journal Prompt from me for the duration of the 30 day project. The project will start on 1st January 2019, starting the New Year off in the way I’m sure you’d like it to continue……..Creatively !!! This is really entirely up to you. There is certainly no need to rush out and invest in lots of art supplies!! You will need a journal or note book of some sort, although even if you don’t have one of these, there’s nothing to stop you working on loose sheets of paper and you can always make these into a journal at a later date if you want to. Use anything that you have to hand, maybe your children have some craft paint and/or pens/pencils that you can use, maybe you have some favourite images from magazines which you can glue into your pages. Use the materials that speak to you and that you have to hand or maybe you could ask for some craft supplies from your local pound store for Christmas. As you can see I was at that time working in a ring bound journal about A5 size, the paper was plain but quite a heavy weight. At first I added paint to the pages then layered on tissue paper. This gave me a base to work on, adding images, the heart and photocopied images of dancing goddess. 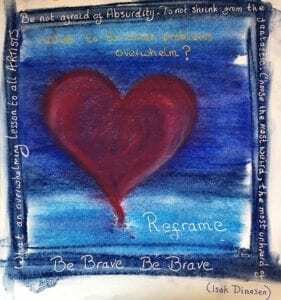 The words I wrote on the heart image were a reminder to myself about self-esteem, confidence & self-love. On the opposite page I wrote a series of words that came to me as I was working on developing a Bhakti Dance Workshop. (Bhakti is a Sanskrit word which might roughly be translated or understood to mean ‘Devotion’) So the concept of the workshop was to combine the practice of dance as a devotional practice within the context of yogic understanding. Of course what you choose to use your journal for and how you choose to use materials is a completely personal thing and totally up to you !! I always love to get feedback. So, if you take part in this Visual Journal Project, do message me with any comments you might have on your experience of taking part.